All flights are conducted in our Bell 206 Longranger or Robinson R44 helicopter as Private Charter options, include lunch, are within 25 to 40 minutes flight time from our base (at Sydney Airport) and spend around two and half hours at the location (plus flight time!). Departing Sydney Airport we take off to the north, flying over the Harbour & spectacular Northern Beaches we track towards Broken Bay and the Central Coast. On landing at Erina, the Reef’s private transfer vehicle will be waiting for the brief drive to the restaurant at Terrigal. Seafood is the star of the show here. The menu is clever without being showy – it is innovative, whilst still maintaining accessibility and simplicity. A dish such as the salt and pepper squid in Provencal sauce is an excellent example of this. 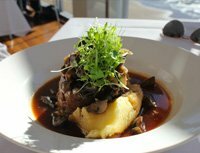 (Pilot’s note: Good all round venue/Ideal romantic escape with top shelf food and service! Restaurant has also won many awards for excellence. This is the most popular Fly & Dine of the 4 packages). 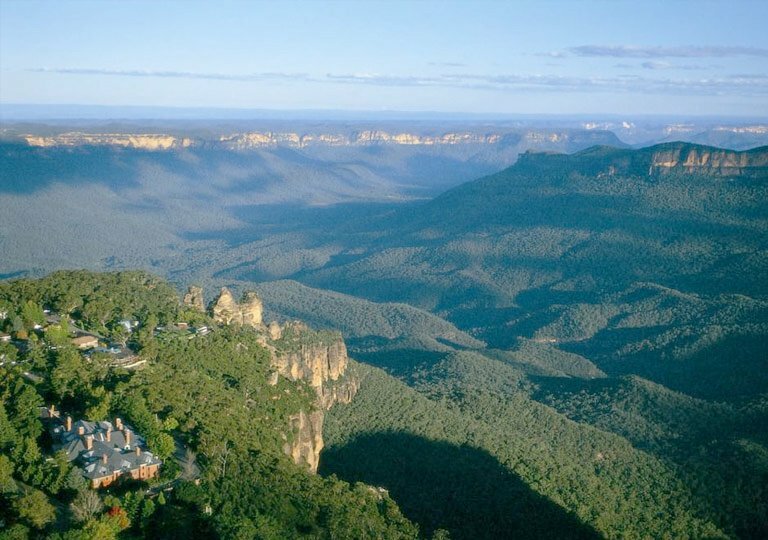 Located in the magnificent World Heritage status Blue Mountains, experience Echoes… Where wilderness meets true luxury. Echoes’ Restaurant and chic bar is perched at the absolute edge of the World Heritage listed Blue Mountains National Park, with views of mountains, cliff edges and lush rainforest valleys right through the Jamison Valley to Mittagong, 80 kilometres away.. Echoes base their food on a modern concept, reflective of Australia’s international influences. Only the freshest local produce is infused with an international palate of flavours and spices. The menu is complemented by a careful selection of high quality boutique Australian wines. Echoes Restaurant has set a new benchmark for style and excellence among Blue Mountains restaurants. Luxurious, dramatic, light-filled and spacious, the dining room and terrace is decked out with bi-folds, manhattan lighting and glass, so that your breathtaking views remain uninterrupted. To complete the ultimate dining experience, Echoes’ bar, suspended over the reception foyer sets a stunning atmosphere where breathtaking views dominates and cosmopolitan style meet. Echoes’ bar caters for pre-dinner drinks and for those more inclined to gossip over a designer-martini or a glass of vintage champagne. 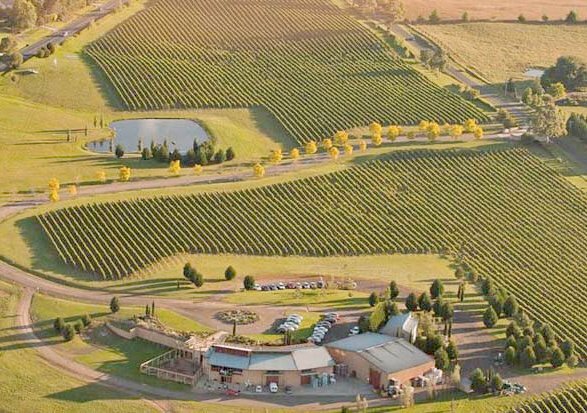 Landing around 40 minutes after our departure, Southern Highlands Wines offers breathtaking views of the sprawling vineyards and is an ideal setting to enjoy a relaxed lunch in the country with amazing food and fine wine. On balmy summer days, the restaurant’s doors open onto the spacious Australian veranda to provide a unique alfresco dining experience. In winter, the cosy and rustic appeal of the restaurant is enhanced by the enormous fireplace. The Southern Highlands has long been regarded as an area of great beauty and relaxation. Take a long, deep breath of the clean, crisp air and gaze across endless rolling green hills, sipping your favourite cool climate red and wondering why you didn’t escape to the Highlands sooner. Southern Highland Wines has created a winery that is fresh, modern and spacious, where you can experience award winning cool climate wines and mouth watering meals. Sample a selection of flavoursome wines, tour through the winery, learn about wine making, relax with a glass of wine and enjoy the tantalising selection of produce. (Pilots note: Our newest addition to our Fly & Dine options, Southern Highlands Wines has a stunning location with superb food & wine). Please note: For all flights that include lunch and a ground based component, we automatically give you Private Charter.